This weekend I just needed a break from the kids and the house so I had some leisurely shopping and hit several stores. I ended up finding some awesome deals - mostly in the markdown bins. You can probably see the brightly colored stickers on many of the items. I went to Fred Meyer to pick up sugar. A 5# bag was on sale for $2.50 which isn't even a good sale, but I was completely out and since I was killing time I stopped there for it. I ended up finding some awesome deals. 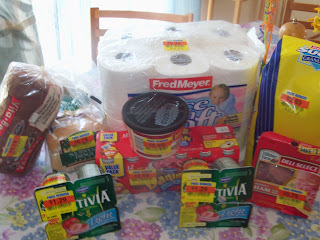 Fred Meyer toilet paper 12 double rolls markdown to $2.49. 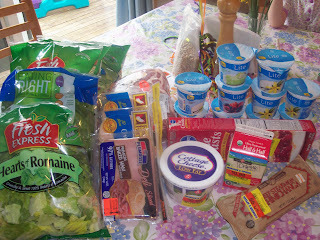 In total I spent $10.20 at Fred Meyer for all this stuff.